More often than not, I buy the frozen kind. Then, it sits in my freezer forever. I always forget about it. I don’t cook much with my freezer – I’m always cooking and having leftovers that if I froze anything, it would pile up immensely and I’d have to purchase a walk-in freezer. Usually, I give leftovers to the doormen or I save them for Lu and me that night. Long story short, I usually forget I have shrimp in the freezer and so, I never cook with it. But, I love shrimp! It’s seriously one of the most underrated proteins. 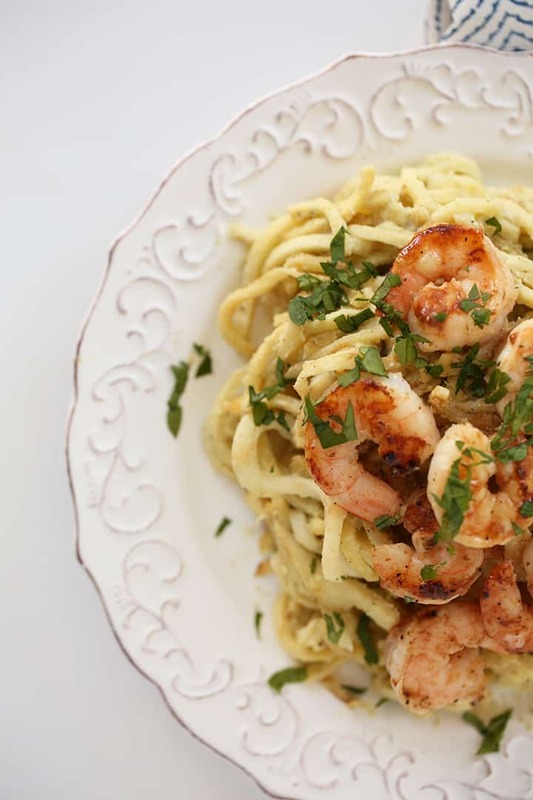 Shrimp are easy (and quick!) to cook, they’re relatively inexpensive and they absorb flavors really well, so it’s always a flavorful seafood. In an effort to use my pantry and my freezer, I came up with today’s delicious recipe. 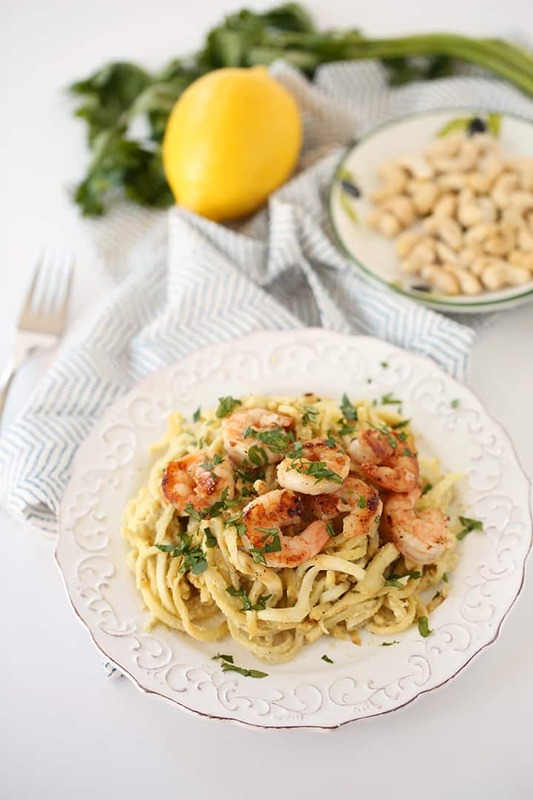 Not only does it have the flavors from the cooked shrimp, but it has the subtle nuttiness of the sautéed parsnip and the freshness from the lemon-basil cashew cream. 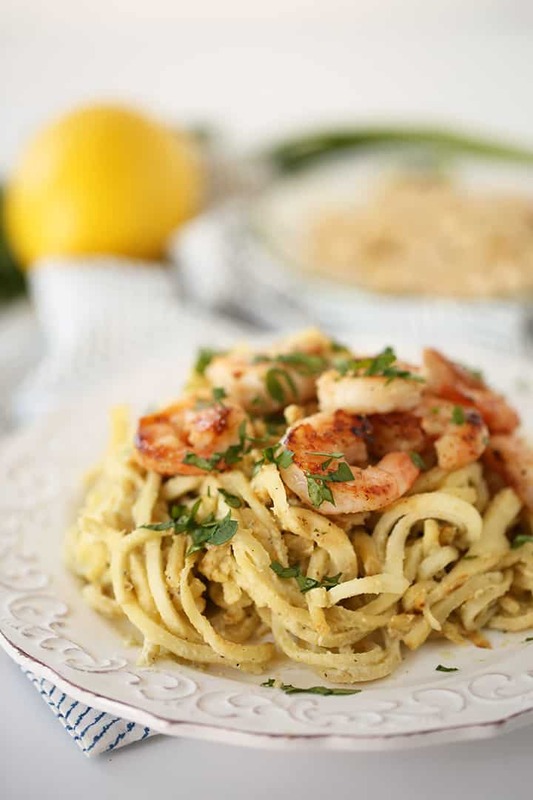 In the summer, I’d switch this up by using zucchini noodles – the cashew cream would be lovely over zucchini noodles, especially with the lemon. The parsnips really absorb the lemon-basil cashew cream sauce, so if you’re saving this as leftovers for the next day, you may want to save an extra couple tablespoons of the sauce to pour on top. Okay, now back to check the freezer and see what else I can muster up. Do you save a lot of meals in the freezer? Place a large skillet over medium heat and coat lightly with cooking spray. Once heated, add in the garlic and shallot and cook for 2 minutes or until shallots soften. Pour the mixture into a food processor or high-speed small blender, along with the pre-soaked cashews, chicken broth, salt and pepper, basil and lemon zest and juice. Pulse until creamy and set aside. Place the large skillet back over medium heat and add in 1 tablespoon of the olive oil. Once oil heats, add in the parsnip noodles and season with salt and pepper. Cover and let cook for 5 minutes or until cooked to al dente. Once done, pour over the cashew sauce and let cook for 1-2 minutes or until warmed. Meanwhile, on another burner, set over another large skillet and add in the rest of the olive oil. Once oil heats, add in the shrimp and season with salt, pepper and garlic powder, tossing to coat both sides. Let cook for 2-3 minutes, flip and then cook another 2 minutes or until shrimp is opaque. Once done, spritz with lemon and remove from heat. 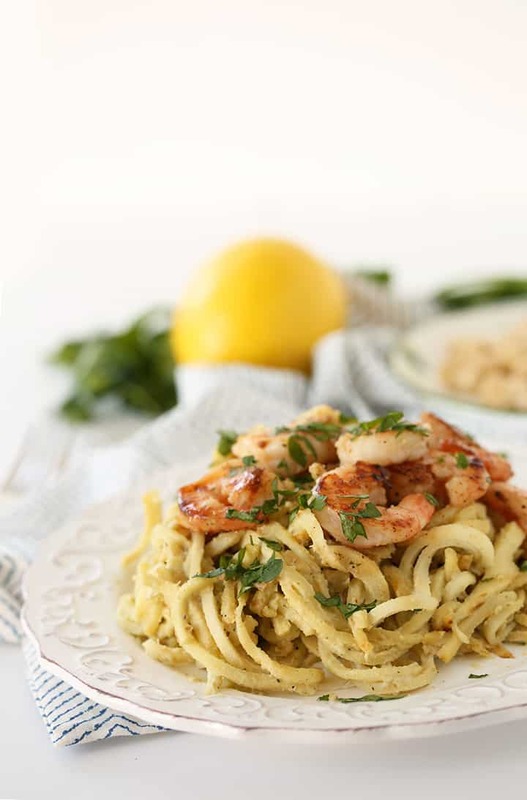 Assemble the pasta: divide the parsnip noodles into two bowls, top with shrimp and garnish with parsley and serve immediately. YUM! Can't wait to make this one!! i just came on your website to look for a parsnip noodle recipe and we have company coming tonight that only eat fish ! Just curious about your use of cashews instead of dairy in a non-vegetarian dish. I LOVE shrimp. I rarely buy it because it is pretty expensive and not a sustainable fish. But this looks so amazing I am going to have to head to the store for shrimp this week! Thanks for sharing! Hmm, no shrimp - going to see if chicken will sub well. Just made it with chicken and it was amazing!!! This is such a beautiful and elegant dish! Love it! This sounds amazing, getting out of bed now (6am UK) to soak some cashew nuts so I can make the sauce before I go to work then all I need to do is put it all together tonight! Thanks for that, dinner sorted! I'm obsessed with your recipes :) Can't wait for the cookbook to ship! This sounds wonderfully flavorful and easy! And yes, I use my freezer all the time! Eating for one, cooking for 2-4 makes for yummy planned-overs for 'don't feel like cooking' days, and busy schedules, too. Plus I get a lot more variety in my diet that way, rather than days of leftover chili in the fridge syndrome. Ali, I made this last night and it is A-M-A-Z-I-N-G!!!! i cannot speak more highly of it. I've reposted it and been telling everyone about it. Maybe it's because I've never made something with a nut sauce, but it tastes like it's a million calories and it's practically vegan! (sans the shrimp of course) I didn't have parsnips so I sub'd with turnips and it still turned out amazing. The cashew sauce is simply divine. THANK YOU!!! Made this last night and used king prawns instead of shrimp. So easy and the complete dish was amazing. Clean plates all round. What do you soak the cashews in? This one is really good! I will be making it again! Should the cashews be unsalted or salted? Ok, nevermind. Raw cashews are unsalted. Oops! I made this tonight. The noodles once covered with the sauce turned into a paste like mess. 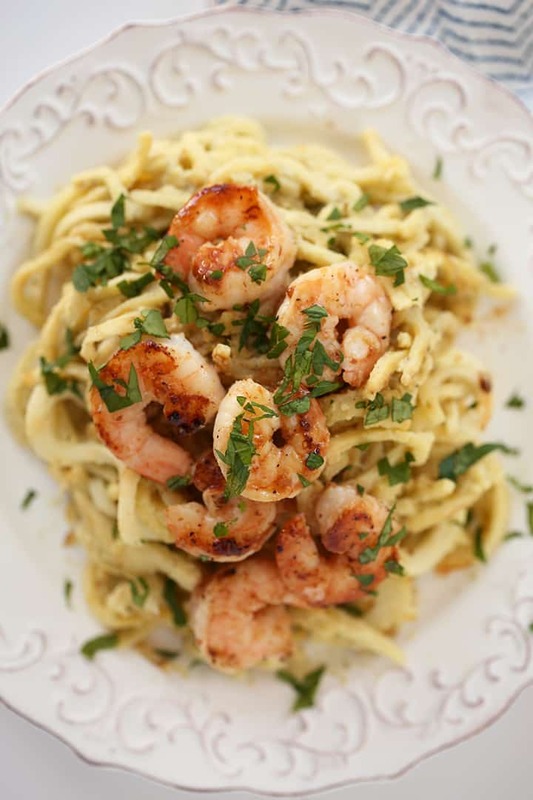 It tasted great with the shrimp on top but I had trouble downing the the sticky noodles . Any help? What did I do wrong? I had the same problem! Made this for dinner tonight and the cashew cream was thick it was hard to choke down. I am def disappointed and know I did something wrong. What other vegetable can be used instead of Parsnip? Made this tonight and it was absolutely delicious! One thing I am confused about is that when I went to enter the nutrition in my tracker, I calculated WAY more calories per serving (578) for these exact ingredients. Curious why your calculation was so much lower. Same here... and the carb content is way more than listed above. I was thinking of doing a side of bacon wrapped asparagus. Any other suggestions for sides? Hosting a Whole30 dinner tomorrow night! Thanks!